Streptococcus pyogenes bacteria (Pappenheim's stain) the trigger for rheumatic fever. Rheumatic fever may occur following an infection of the throat by the bacterium Streptococcus pyogenes. If the infection is untreated rheumatic fever can occur in up to three percent of people. The underlying mechanism is believed to involve the production of antibodies against a person's own tissues. Due to their genetics, some people are more likely to get the disease when exposed to the bacteria than others. Other risk factors include malnutrition and poverty. Diagnosis of RF is often based on the presence of signs and symptoms in combination with evidence of a recent streptococcal infection. Treating people who have strep throat with antibiotics, such as penicillin, decreases the risk of developing rheumatic fever. In order to avoid antibiotic misuse this often involves testing people with sore throats for the infection, which may not be available in the developing world. Other preventive measures include improved sanitation. In those with rheumatic fever and rheumatic heart disease, prolonged periods of antibiotics are sometimes recommended. Gradual return to normal activities may occur following an attack. Once RHD develops, treatment is more difficult. Occasionally valve replacement surgery or valve repair is required. Otherwise complications are treated as per normal. Rheumatic fever occurs in about 325,000 children each year and about 33.4 million people currently have rheumatic heart disease. Those who develop RF are most often between the ages of 5 and 14, with 20% of first-time attacks occurring in adults. The disease is most common in the developing world and among indigenous peoples in the developed world. In 2015 it resulted in 319,400 deaths down from 374,000 deaths in 1990. Most deaths occur in the developing world where as many as 12.5% of people affected may die each year. Descriptions of the condition are believed to date back to at least the 5th century BCE in the writings of Hippocrates. The disease is so named because its symptoms are similar to those of some rheumatic disorders. The disease typically develops two to four weeks after a throat infection. Symptoms include: fever, painful joints with those joints affected changing with time, involuntary muscle movements, and occasionally a characteristic non-itchy rash known as erythema marginatum. The heart is involved in about half of the cases. Damage to the heart valves usually occurs only after multiple attacks but may occasionally occur after a single case of RF. The damaged valves may result in heart failure and also increase the risk of atrial fibrillation and infection of the valves. Rheumatic fever is a systemic disease affecting the connective tissue around arterioles, and can occur after an untreated strep throat infection, specifically due to group A streptococcus (GAS), Streptococcus pyogenes. It is believed to be caused by antibody cross-reactivity. This cross-reactivity is a type II hypersensitivity reaction and is termed molecular mimicry. Usually, self reactive B cells remain anergic in the periphery without T cell co-stimulation. During a streptococcal infection, mature antigen-presenting cells such as B cells present the bacterial antigen to CD4+T cells which differentiate into helper T2 cells. Helper T2 cells subsequently activate the B cells to become plasma cells and induce the production of antibodies against the cell wall of Streptococcus. However the antibodies may also react against the myocardium and joints, producing the symptoms of rheumatic fever. 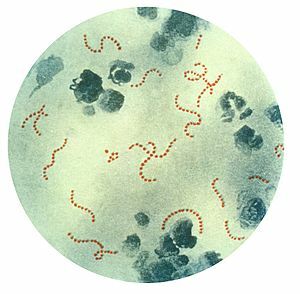 S. pyogenes is a species of aerobic, cocci, gram-positive bacteria that are non-motile, non-spore forming, and forms chains and large colonies. S. pyogenes has a cell wall composed of branched polymers which sometimes contain M protein, a virulence factor that is highly antigenic. The antibodies which the immune system generates against the M protein may cross-react with heart muscle cell protein myosin, heart muscle glycogen and smooth muscle cells of arteries, inducing cytokine release and tissue destruction. However, the only proven cross-reaction is with perivascular connective tissue. This inflammation occurs through direct attachment of complement and Fc receptor-mediated recruitment of neutrophils and macrophages. Characteristic Aschoff bodies, composed of swollen eosinophilic collagen surrounded by lymphocytes and macrophages can be seen on light microscopy. The larger macrophages may become Anitschkow cells or Aschoff giant cells. Rheumatic valvular lesions may also involve a cell-mediated immunity reaction as these lesions predominantly contain T-helper cells and macrophages. In rheumatic fever, these lesions can be found in any layer of the heart causing different types of carditis. The inflammation may cause a serofibrinous pericardial exudate described as "bread-and-butter" pericarditis, which usually resolves without sequelae. Involvement of the endocardium typically results in fibrinoid necrosis and wart formation along the lines of closure of the left-sided heart valves. Warty projections arise from the deposition, while subendocardial lesions may induce irregular thickenings called MacCallum plaques. Chronic rheumatic heart disease (RHD) is characterized by repeated inflammation with fibrinous repair. The cardinal anatomic changes of the valve include leaflet thickening, commissural fusion, and shortening and thickening of the tendinous cords. It is caused by an autoimmune reaction to Group A β-hemolytic streptococci (GAS) that results in valvular damage. Fibrosis and scarring of valve leaflets, commissures and cusps leads to abnormalities that can result in valve stenosis or regurgitation. The inflammation caused by rheumatic fever, usually during childhood, is referred to as rheumatic valvulitis. About half of patients with rheumatic fever develop inflammation involving valvular endothelium. The majority of morbidity and mortality associated with rheumatic fever is caused by its destructive effects on cardiac valve tissue. The pathogenesis of RHD is complex and not fully understood, but it is known to involve molecular mimicry and genetic predisposition that lead to autoimmune reactions. Molecular mimicry occurs when epitopes are shared between host antigens and Streptococcus antigens. This causes an autoimmune reaction against native tissues in the heart that are incorrectly recognized as "foreign" due to the cross-reactivity of antibodies generated as a result of epitope sharing. The valvular endothelium is a prominent site of lymphocyte-induced damage. CD4+ T cells are the major effectors of heart tissue autoimmune reactions in RHD. Normally, T cell activation is triggered by the presentation of bacterial antigens. In RHD, molecular mimicry results in incorrect T cell activation, and these T lymphocytes can go on to activate B cells, which will begin to produce self-antigen-specific antibodies. This leads to an immune response attack mounted against tissues in the heart that have been misidentified as pathogens. Rheumatic valves display increased expression of VCAM-1, a protein that mediates the adhesion of lymphocytes. Self-antigen-specific antibodies generated via molecular mimicry between human proteins and streptococcal antigens up-regulate VCAM-1 after binding to the valvular endothelium. This leads to the inflammation and valve scarring observed in rheumatic valvulitis, mainly due to CD4+ T cell infiltration. While the mechanisms of genetic predisposition remain unclear, a few genetic factors have been found to increase susceptibility to autoimmune reactions in RHD. The dominant contributors are a component of MHC class II molecules, found on lymphocytes and antigen-presenting cells, specifically the DR and DQ alleles on human chromosome 6. Certain allele combinations appear to increase RHD autoimmune susceptibility. Human leukocyte antigen (HLA) class II allele DR7 (HLA-DR7) is most often associated with RHD, and its combination with certain DQ alleles is seemingly associated with the development of valvular lesions. The mechanism by which MHC class II molecules increase a host's susceptibility to autoimmune reactions in RHD is unknown, but it is likely related to the role HLA molecules play in presenting antigens to T cell receptors, thus triggering an immune response. Also found on human chromosome 6 is the cytokine TNF-α which is also associated with RHD. High expression levels of TNF-α may exacerbate valvular tissue inflammation, contributing to RHD pathogenesis. Mannose-binding lectin (MBL) is an inflammatory protein involved in pathogen recognition. Different variants of MBL2 gene regions are associated in RHD. RHD-induced mitral valve stenosis has been associated with MBL2 alleles encoding for high production of MBL. Aortic valve regurgitation in RHD patients has been associated with different MBL2 alleles that encode for low production of MBL. Other genes are also being investigated to better understand the complexity of autoimmune reactions that occur in RHD. Modified Jones criteria were first published in 1944 by T. Duckett Jones, MD. They have been periodically revised by the American Heart Association in collaboration with other groups. According to revised Jones criteria, the diagnosis of rheumatic fever can be made when two of the major criteria, or one major criterion plus two minor criteria, are present along with evidence of streptococcal infection: elevated or rising antistreptolysin O titre or DNAase. Exceptions are chorea and indolent carditis, each of which by itself can indicate rheumatic fever. An April 2013 review article in the Indian Journal of Medical Research stated that echocardiographic and Doppler (E & D) studies, despite some reservations about their utility, have identified a massive burden of rheumatic heart disease, which suggests the inadequacy of the 1992 Jones' criteria. E & D studies have identified subclinical carditis in patients with rheumatic fever, as well as in follow-ups of rheumatic heart disease patients who initially presented as having isolated cases of Sydenham's chorea. Signs of a preceding streptococcal infection include: recent scarlet fever, raised antistreptolysin O or other streptococcal antibody titre, or positive throat culture. Carditis: Inflammation of the heart muscle (myocarditis) which can manifest as congestive heart failure with shortness of breath, pericarditis with a rub, or a new heart murmur. Sydenham's chorea (St. Vitus' dance): A characteristic series of involuntary rapid movements of the face and arms. This can occur very late in the disease for at least three months from onset of infection. Rheumatic fever can be prevented by effectively treating strep throat with antibiotics. In those who have previously had rheumatic fever, antibiotics in a preventative manner are occasionally recommended. As of 2017 the evidence to support long term antibiotics in those with underlying disease is poor. The American Heart Association suggests that dental health be maintained, and that people with a history of bacterial endocarditis, a heart transplant, artificial heart valves, or "some types of congenital heart defects" may wish to consider long-term antibiotic prophylaxis. The management of rheumatic fever is geared toward the reduction of inflammation with anti-inflammatory medications such as aspirin or corticosteroids. Individuals with positive cultures for strep throat should also be treated with antibiotics. Aspirin is the drug of choice and should be given at high doses. One should watch for side effects like gastritis and salicylate poisoning. In children and teenagers, the use of aspirin and aspirin-containing products can be associated with Reye's syndrome, a serious and potentially deadly condition. The risks, benefits, and alternative treatments must always be considered when administering aspirin and aspirin-containing products in children and teenagers. Ibuprofen for pain and discomfort and corticosteroids for moderate to severe inflammatory reactions manifested by rheumatic fever should be considered in children and teenagers. No vaccines are currently available to protect against S. pyogenes infection, although research is underway to develop one. Difficulties in developing a vaccine include the wide variety of strains of S. pyogenes present in the environment and the large amount of time and people that will be needed for appropriate trials for safety and efficacy of the vaccine. People with positive cultures for Streptococcus pyogenes should be treated with penicillin as long as allergy is not present. The use of antibiotics will not alter cardiac involvement in the development of rheumatic fever. Some suggest the use of benzathine benzylpenicillin. Monthly injections of long-acting penicillin must be given for a period of five years in patients having one attack of rheumatic fever. If there is evidence of carditis, the length of therapy may be up to 40 years. Another important cornerstone in treating rheumatic fever includes the continual use of low-dose antibiotics (such as penicillin, sulfadiazine, or erythromycin) to prevent recurrence. Steroids are reserved for cases where there is evidence of an involvement of the heart. The use of steroids may prevent further scarring of tissue and may prevent the development of sequelae such as mitral stenosis. Some patients develop significant carditis which manifests as congestive heart failure. This requires the usual treatment for heart failure: ACE inhibitors, diuretics, beta blockers, and digoxin. Unlike typical heart failure, rheumatic heart failure responds well to corticosteroids. About 33 million people are affected by rheumatic heart disease with an additional 47 million having asymptomatic damage to their heart valves. As of 2010 globally it resulted in 345,000 deaths, down from 463,000 in 1990. In Western countries, rheumatic fever has become fairly rare since the 1960s, probably due to the widespread use of antibiotics to treat streptococcus infections. While it has been far less common in the United States since the beginning of the 20th century, there have been a few outbreaks since the 1980s. The disease is most common among Indigenous Australians (particularly in central and northern Australia), Māori, and Pacific Islanders, and is also common in Sub-Saharan Africa, Latin America, the Indian Subcontinent, the Middle East, and North Africa. Rheumatic fever primarily affects children between ages 5 and 17 years and occurs approximately 20 days after strep throat. In up to a third of cases, the underlying strep infection may not have caused any symptoms. The recurrence of rheumatic fever is relatively common in the absence of maintenance of low dose antibiotics, especially during the first three to five years after the first episode. Recurrent bouts of rheumatic fever can lead to valvular heart disease. Heart complications may be long-term and severe, particularly if valves are involved. In countries in Southeast-Asia, sub-saharan Africa, and Oceania, the percentage of people with rheumatic heart disease detected by listening to the heart was 2.9 per 1000 children and by echocardiography it was 12.9 per 1000 children. ^ a b c d e f g h i j k l m n o p q r s t u v w x y z aa ab ac Marijon, E; Mirabel, M; Celermajer, DS; Jouven, X (10 March 2012). "Rheumatic heart disease". Lancet. 379 (9819): 953–64. doi:10.1016/S0140-6736(11)61171-9. PMID 22405798. ^ a b c Lee, KY; Rhim, JW; Kang, JH (March 2012). "Kawasaki disease: laboratory findings and an immunopathogenesis on the premise of a "protein homeostasis system"". Yonsei Medical Journal. 53 (2): 262–75. doi:10.3349/ymj.2012.53.2.262. PMC 3282974. PMID 22318812. ^ a b "Rheumatic Fever 1997 Case Definition". cdc.gov. 3 February 2015. Archived from the original on 19 February 2015. Retrieved 19 February 2015. ^ a b Spinks, A; Glasziou, PP; Del Mar, CB (5 November 2013). "Antibiotics for sore throat". The Cochrane Database of Systematic Reviews. 11: CD000023. doi:10.1002/14651858.CD000023.pub4. PMID 24190439. ^ Ashby, Carol Turkington, Bonnie Lee (2007). The encyclopedia of infectious diseases (3rd ed.). New York: Facts On File. p. 292. ISBN 9780816075072. Archived from the original on 21 November 2015. ^ a b Kumar, Vinay; Abbas, Abul K; Fausto, Nelson; Mitchell, Richard N (2007). Robbins Basic Pathology (8th ed.). Saunders Elsevier. pp. 403–6. ISBN 978-1-4160-2973-1. ^ Quinn, RW (1991). "Did scarlet fever and rheumatic fever exist in Hippocrates' time?". Reviews of Infectious Diseases. 13 (6): 1243–4. doi:10.1093/clinids/13.6.1243. PMID 1775859. ^ Abbas, Abul K.; Lichtman, Andrew H.; Baker, David L.; et al. (2004). Basic immunology: functions and disorders of the immune system (2 ed.). Philadelphia, Pennsylvania: Elsevier Saunders. ISBN 978-1-4160-2403-3. ^ "Streptococcus pyogenes – Pathogen Safety Data Sheets". Public Health Agency of Canada. 18 February 2011. Archived from the original on 17 January 2017. Retrieved 15 April 2017. ^ Faé KC, da Silva DD, Oshiro SE, et al. (May 2006). "Mimicry in recognition of cardiac myosin peptides by heart-intralesional T cell clones from rheumatic heart disease". J. Immunol. 176 (9): 5662–70. doi:10.4049/jimmunol.176.9.5662. PMID 16622036. ^ a b Cotran, Ramzi S.; Kumar, Vinay; Fausto, Nelson; Nelso Fausto; Robbins, Stanley L.; Abbas, Abul K. (2005). Robbins and Cotran pathologic basis of disease. St. Louis, Mo: Elsevier Saunders. ISBN 0-7216-0187-1. Archived from the original on 10 September 2005. ^ Kaplan, MH; Bolande, R; Rakita, L; Blair, J (1964). "Presence of Bound Immunoglobulins and Complement in the Myocardium in Acute Rheumatic Fever. Association with Cardiac Failure". The New England Journal of Medicine. 271 (13): 637–45. doi:10.1056/NEJM196409242711301. PMID 14170842. ^ a b Brice, Edmund A. W; Commerford, Patrick J. (2005). "Rheumatic Fever and Valvular Heart Disease". In Rosendorff, Clive (ed.). Essential Cardiology: Principles and Practice. Totowa, New Jersey: Humana Press. pp. 545–563. doi:10.1007/978-1-59259-918-9_30. ISBN 978-1-59259-918-9. ^ Caldas, AM; Terreri, MT; Moises, VA; Silva, CM; Len, CA; Carvalho, AC; Hilário, MO (2008). "What is the true frequency of carditis in acute rheumatic fever? A prospective clinical and Doppler blind study of 56 children with up to 60 months of follow-up evaluation". Pediatric cardiology. 29 (6): 1048–53. doi:10.1007/s00246-008-9242-z. PMID 18825449. ^ Guilherme, L; Kalil, J; Cunningham, M (2006). "Molecular mimicry in the autoimmune pathogenesis of rheumatic heart disease". Autoimmunity. 39 (1): 31–9. doi:10.1080/08916930500484674. PMID 16455580. ^ Kemeny, E; Grieve, T; Marcus, R; Sareli, P; Zabriskie, JB (1989). "Identification of mononuclear cells and T cell subsets in rheumatic valvulitis". Clinical immunology and immunopathology. 52 (2): 225–37. doi:10.1016/0090-1229(89)90174-8. PMID 2786783. ^ a b Roberts, S; Kosanke, S; Terrence Dunn, S; Jankelow, D; Duran, CM; Cunningham, MW (2001). "Pathogenic mechanisms in rheumatic carditis: Focus on valvular endothelium". The Journal of Infectious Diseases. 183 (3): 507–11. doi:10.1086/318076. PMID 11133385. ^ a b c Stanevicha, V; Eglite, J; Sochnevs, A; Gardovska, D; Zavadska, D; Shantere, R (2003). "HLA class II associations with rheumatic heart disease among clinically homogeneous patients in children in Latvia". Arthritis Research & Therapy. 5 (6): R340–R346. doi:10.1186/ar1000. PMC 333411. PMID 14680508. ^ Schafranski, MD; Pereira Ferrari, L; Scherner, D; Torres, R; Jensenius, JC; De Messias-Reason, IJ (2008). "High-producing MBL2 genotypes increase the risk of acute and chronic carditis in patients with history of rheumatic fever". Molecular Immunology. 45 (14): 3827–31. doi:10.1016/j.molimm.2008.05.013. PMID 18602696. ^ Ramasawmy, R; Spina, GS; Fae, KC; Pereira, AC; Nisihara, R; Messias Reason, IJ; Grinberg, M; Tarasoutchi, F; Kalil, J; Guilherme, L. (2008). "Association of Mannose-Binding Lectin Gene Polymorphism but Not of Mannose-Binding Serine Protease 2 with Chronic Severe Aortic Regurgitation of Rheumatic Etiology". Clinical and Vaccine Immunology. 15 (6): 932–936. doi:10.1128/CVI.00324-07. PMC 2446618. PMID 18400978. ^ Jones, T Duckett (1944). "The diagnosis of rheumatic fever". JAMA. 126 (8): 481–4. doi:10.1001/jama.1944.02850430015005. ^ Ferrieri, P; Jones Criteria Working, Group (2002). "Proceedings of the Jones Criteria workshop". Circulation. Jones Criteria Working Group. 106 (19): 2521–3. doi:10.1161/01.CIR.0000037745.65929.FA. PMID 12417554. Archived from the original on 31 December 2005. ^ Parrillo, Steven J. "Rheumatic Fever". eMedicine. DO, FACOEP, FACEP. Archived from the original on 8 July 2007. Retrieved 14 July 2007. ^ "Guidelines for the diagnosis of rheumatic fever. Jones Criteria, 1992 update". JAMA. Special Writing Group of the Committee on Rheumatic Fever, Endocarditis, and Kawasaki Disease of the Council on Cardiovascular Disease in the Young of the American Heart Association. 268 (15): 2069–73. 1992. doi:10.1001/jama.268.15.2069. PMID 1404745. ^ Saxena, Anita (2000). "Diagnosis of rheumatic fever: Current status of Jones criteria and role of echocardiography". Indian Journal of Pediatrics. 67 (4): 283–6. doi:10.1007/BF02758174. PMID 11129913. ^ Kumar, RK; Tandon, R (2013). "Rheumatic fever & rheumatic heart disease: The last 50 years". The Indian Journal of Medical Research. 137 (4): 643–658. PMC 3724245. PMID 23703332. ^ a b Ed Boon, Davidson's General Practice of Medicine, 20th edition. P. 617. ^ a b c "WHO | Rheumatic fever and rheumatic heart disease". www.who.int. Archived from the original on 7 March 2017. Retrieved 1 February 2017. ^ Aly, Ashraf (2008). "Rheumatic Fever". Core Concepts of Pediatrics. University of Texas. Archived from the original on 24 May 2011. Retrieved 6 August 2011. ^ a b Gerber, MA; Baltimore, RS; Eaton, CB; Gewitz, M; Rowley, AH; Shulman, ST; Taubert, KA (24 March 2009). "Prevention of rheumatic fever and diagnosis and treatment of acute Streptococcal pharyngitis: a scientific statement from the American Heart Association Rheumatic Fever, Endocarditis, and Kawasaki Disease Committee of the Council on Cardiovascular Disease in the Young, the Interdisciplinary Council on Functional Genomics and Translational Biology, and the Interdisciplinary Council on Quality of Care and Outcomes Research: endorsed by the American Academy of Pediatrics". Circulation. 119 (11): 1541–51. doi:10.1161/circulationaha.109.191959. PMID 19246689. ^ a b Nulu, S; Bukhman, G; Kwan, GF (February 2017). "Rheumatic Heart Disease: The Unfinished Global Agenda". Cardiology clinics. 35 (1): 165–180. doi:10.1016/j.ccl.2016.08.006. PMID 27886787. ^ "What About My Child and Rheumatic Fever?" (PDF). American Heart Association. Archived (PDF) from the original on 6 April 2013. Retrieved 23 February 2014. ^ "Aspirin Monograph for Professionals - Drugs.com". Drugs.com. American Society of Health-System Pharmacists. Archived from the original on 25 April 2017. Retrieved 30 March 2017. ^ "Collaboration aims for rheumatic fever vaccine". sciencemediacentre.co.nz. 18 September 2014. Archived from the original on 15 April 2017. Retrieved 16 April 2017. ^ "Initiative for Vaccine Research (IVR) – Group A Streptococcus". World Health Organization. Archived from the original on 13 May 2012. Retrieved 15 June 2012. ^ "WHO Disease and injury country estimates". World Health Organization. 2009. Archived from the original on 2 February 2014. Retrieved 11 November 2009. ^ Lozano R, Naghavi M, Foreman K, Lim S, Shibuya K, Aboyans V, et al. (2012). "Global and regional mortality from 235 causes of death for 20 age groups in 1990 and 2010: a systematic analysis for the Global Burden of Disease Study 2010". Lancet. 380 (9859): 2095–128. doi:10.1016/S0140-6736(12)61728-0. PMID 23245604. ^ "Rheumatic fever". Medline Plus Medical Encyclopedia. NLM/NIH. Archived from the original on 7 April 2016. ^ "Rheumatic heart disease". Menzies Institute for Medical Research. Retrieved 1 September 2018. ^ Marijon, Eloi; Ou, Phalla; Celermajer, David S.; Ferreira, Beatriz; Mocumbi, Ana Olga; Jani, Dinesh; Paquet, Christophe; Jacob, Sophie; Sidi, Daniel (2 August 2007). "Prevalence of rheumatic heart disease detected by echocardiographic screening". The New England Journal of Medicine. 357 (5): 470–476. doi:10.1056/NEJMoa065085. ISSN 1533-4406. PMID 17671255. ^ Rothenbühler, Martina; O'Sullivan, Crochan J.; Stortecky, Stefan; Stefanini, Giulio G.; Spitzer, Ernest; Estill, Janne; Shrestha, Nikesh R.; Keiser, Olivia; Jüni, Peter (1 December 2014). "Active surveillance for rheumatic heart disease in endemic regions: a systematic review and meta-analysis of prevalence among children and adolescents". The Lancet Global Health. 2 (12): e717–726. doi:10.1016/S2214-109X(14)70310-9. ISSN 2214-109X. PMID 25433627. ^ Shrestha NR; Karki P; Mahto R; et al. (2 March 2016). "Prevalence of subclinical rheumatic heart disease in eastern nepal: A school-based cross-sectional study". JAMA Cardiology. 1: 89. doi:10.1001/jamacardio.2015.0292. ISSN 2380-6583. ^ Beaton, Andrea; Okello, Emmy; Lwabi, Peter; Mondo, Charles; McCarter, Robert; Sable, Craig (26 June 2012). "Echocardiography screening for rheumatic heart disease in Ugandan schoolchildren". Circulation. 125 (25): 3127–3132. doi:10.1161/CIRCULATIONAHA.112.092312. ISSN 1524-4539. PMID 22626741. "Jones major criteria". Archived from the original on 4 August 2017.